The nature of work is changing. As jobs in traditional sectors are lost to automation, entirely new careers paths are emerging in the social sphere. 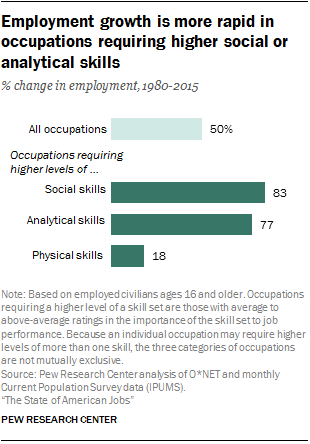 Data analysis from Pew Research Center shows that job categories requiring social, technical, and analytical skills are growing significantly faster than the average for all job categories. Image via Pew Research Center. Perhaps it’s no surprise, then, that LinkedIn currently lists more than 90,000 social media job openings worldwide. So, you want to know how to find a job in social media? Here are some key ways to connect with recruiters, develop and highlight your social media expertise, and craft a winning application package—including a resume template—to help you land a social media job. In smaller companies, these roles may all be bundled into one position. That means when applying to a small team, you’ll likely want to present yourself as a social media generalist, with broad skills across all of these areas, whereas for larger social teams you’ll want to highlight your specific expertise in one key role. It’s never too early to start thinking about which type of role you’re best suited for so you can focus your job search, education, and skill-building using the right framework. Your social media accounts reveal a lot about you—and prospective employers are likely to seek that information out, looking for clues about your qualifications for the job or your fit with the corporate culture based on what you post online. Still, according to a national Harris Poll survey on behalf of CareerBuilder, nearly half of hiring managers who use social media to screen candidates have found something that caused them to take someone out of the running for a job. The worst social media offenses? Provocative or inappropriate photos, videos, or information (46 percent) and information about drinking or using drugs (43 percent). So, should you just lock down your social media profile? No. The CareerBuilder survey also found that a third of hiring managers who screen using social media found something on social that actually caused them to hire a candidate. When thinking about how to get a job in social media, take a close look at your social profiles to make sure they show you at your best. Look for any less-than-ideal posts or photos you may have shared back in your carefree college or high-school days, and ensure your most recent posts showcase your current skills and relevant expertise. Here are some key strategies to keep in mind when developing your professional social media presence. Craft a professional bio that showcases your personality, maintaining consistency in your key points but tailoring the length and tone for each social network. Check out our posts about how to write an effective bio for Twitter and Instagram. Keep your profile image professional and consistent across networks, but resize it to the optimal dimensions for each network using these image specifications. Post to your social channels regularly and with interesting insights, whether by creating your own content or sharing your thoughts on content created by others. Follow relevant accounts, influencers, hashtags, and brands to keep abreast of what’s happening in the industry and keep an eye out for job postings. Connect with people in your industry through Twitter chats, LinkedIn Groups, and other social spaces where you can foster relationships that provide mutual value and extend your network. Keep in mind that 70 percent of people who were hired in 2016 had an existing connection at the company, and referred applicants are 15 times more likely to be hired than those who apply through a job board. If you’d like an inside look at how these strategies worked for a real person, Hootsuite copywriter Sarah Dawley shares how she used social (especially Twitter) to kick start her own social media career in her blog post How to Land Your First Job Using Social Media. Social media professionals wear a lot of hats, with responsibilities ranging from writing to revenue tracking, often all wrapped up into one position. They also need to have their finger on the pulse of the industry, knowing about the latest developments in social that can have a big impact on social media strategy. Hootsuite Academy offers free online social media courses on key topics like social marketing, content marketing, and social advertising. More than 200,000 social media professionals have benefitted from this online learning program developed by Hootsuite’s social media experts. More advanced users can pursue official Hootsuite Academy certifications. Completing these will get you listed in the Hootsuite Academy Directory alongside other certified social media pros. Many social networks also have their own training and certification programs to help social media professionals learn the best ways to use each network’s specific tools—and highlight that proficiency to potential employers on your resume. You can learn about Facebook Blueprint, Google AdWords certification, Twitter Flight School, Pinterest Propel, and more in our post on brand certifications to make you a better social media marketer. Keep in mind that training is an ongoing process. Pew Research Center data shows that more than half of American adults across all job sectors say it will be essential to engage in ongoing training and skills development throughout their working life in order to remain employable—and 35 percent of working adults say they need more education or training now to get ahead in the job they already have. This is especially true for social media professionals, who work in a landscape that is constantly changing. It may be frustrating to browse social media job postings, only to find that they all require at least some level of experience. So, how do you get that experience if you’re seeking out your first social media job? Volunteer to create or manage the social media accounts for a charity or community organization you’re involved with or that speaks to your personal values. If you don’t have the time to take on an ongoing commitment, look for opportunities to get involved with the social media for an event, which will have a set end date. Look for a social media internship to develop real-world on-the-job skills. Make sure the internship aligns closely with your desired career path so that you gain the most relevant experience. If you already have a marketing job but no social media experience, talk to your employer about ways you could help contribute to the company’s social media presence. Develop, implement, and track the results of a social media strategy for your own blog, business, or personal brand. Job seekers in all fields are turning to social media to connect with companies and look for work. In fact, watching for posts about employment opportunities is the most common reason for internet users in Spain to follow brands on social, while the amount of time U.K. internet users spent on LinkedIn jumped 87 percent between December 2016 and March of this year. LinkedIn is the obvious choice when it comes to searching out jobs using social media—the network currently has more than 10 million job listings. But beyond its job search functionality, LinkedIn offers important networking opportunities for social media professionals, especially through LinkedIn Groups. Social channels also provide an important way to research prospective employers and learn about company culture. Facebook and LinkedIn are the most common channels for researching prospective employers, except among 18- to 29-year-olds, who favor Instagram for this purpose. Company hashtags (for example, #hootsuitelife and #hootjobs) can give you a peek inside a company’s office life and highlight current job postings. Here’s the simple truth: A hiring manager is unlikely to read through your entire application before making an initial yes-or-no decision about you. They might not even see all the resumes submitted, as an HR person, recruiter, or even software might conduct an initial screen to match applicants against the job requirements. In fact, a recent study found that recruiters spend on average only six seconds screening each resume. Now let’s look at some key ways to get your resume into the “in” pile and avoid the “out” pile on that critical first sort. Read the job posting carefully and make sure your resume addresses all of the points required. You may even want to mirror the language from the ad to make it easy to match your experience to the requirements—especially in case the first sort is done by software. Also, be sure to address the requirements stated for the application package itself. For example, while only 26 percent of recruiters view cover letters as important, you’ll be setting yourself up for failure if you don’t include a cover letter when the job posting requests one. Many organizations are focused on proving the ROI of social, so highlight experience that demonstrates you can get results—including numbers from real-world wins whenever possible. For example, you could highlight the growth of social channels during your tenure, the success of campaigns you ran, and so on. Keep this tight and to the point, using active language. Tailor your application to each company, and be sure to include a sentence that shows you know what the company is all about. Then, highlight how you can contribute to the company’s goals or what you can contribute to the specific role or the corporate culture. For example, if you regularly participate in a company’s Twitter chat (like #hootchat), be sure to say so and highlight something you’ve learned. Be sure to proofread your application. Reading it out loud is a great way to slow yourself down and catch mistakes. It’s also worth asking a friend or colleague you trust to take a look with a fresh set of eyes. Since a standout resume is critical, we’ve created a a few resume templates for social media marketing professionals to ensure you cover all the bases. To use the templates simply click File in the upper left-hand corner, then select Make a copy from the drop-down menu. Learn the social media marketing skills you need to land your dream job with free training from Hootsuite Academy.